Bed in a bag sets are an easy, fun way to get the designer bedding you want for a truly exceptional value. Here at Laurens Linens, we are pleased to be able to offer our customers a great selection of bed in a bag sets to complement any bedroom and any decor. Besides being an exceptional value, our bed in a bag collections are a simple way to coordinate all of your bedroom linens in minutes. The sets contain everything you need from comforters to pillowcases to create the room of your dreams. Our designer bed in a bag sets also include high thread count sheets, for the style and luxury you want. If you need additional accessories, we also offer a selection of deluxe bed in a bag sets that include bed skirts, blankets, pillow shams and more! You don’t need to spend a lot of money to get the style and sophistication you’ve been dreaming of. Explore our many bed in a bag options to find the style that suits your personality. Bed In A Bag terminology can be a little confusing, so we have listed a few terms below to let you know exactly what you are getting when you order a bed in a bag set from Laurens Linens. Bed In A Bag: Comforter, Bed Skirt, Pillow Sham/s, Complete Sheet Set. Mini Bed In A Bag: Comforter, Sham's, Sheet Set (No Bed Skirt). 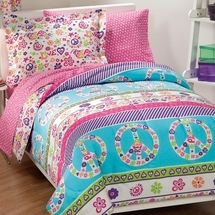 Comforter/Sheet Set: Comforter & Sheet Set only (No Bed Skirt or Shams). Comforter Set: Comforter, Bed Skirt, Pillow Sham/s. (No Sheets or Pillowcases). Order a complete bed in a bag set from Laurens Linens today and you can be assured of receiving quality bedding from the finest names in home textiles. We offer very competitive prices and prompt shipping, backed by over 36 years of experience. Give us a try, we promise you won't be disappointed.